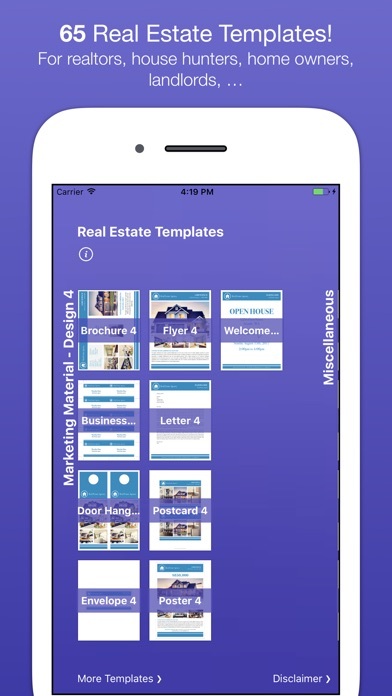 65 REAL ESTATE TEMPLATES Real Estate Templates (for Pages & Numbers) is a valuable add-on for Apple's Pages and Numbers apps. 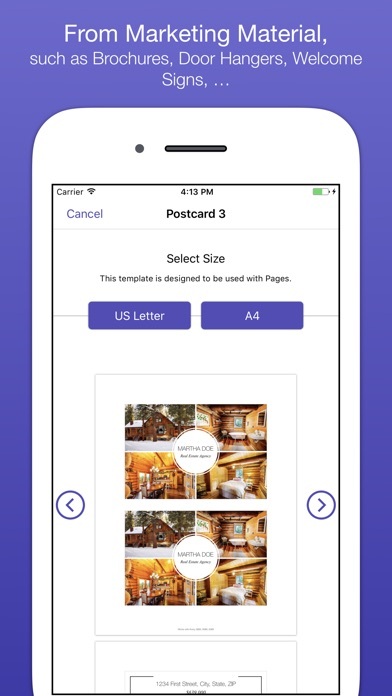 It provides 65 real estate templates for realtors, house hunters, home owners, landlords… DIFFERENT PAPER SIZES All Pages and Numbers templates are available in US Letter and A4, except the envelopes (2 common envelope sizes) and the posters (tabloid). 8 CHECKLISTS Critical Date Checklist (Numbers) Home Inspection Checklist 1 (Pages) Home Inspection Checklist 2 (Numbers) House Hunting Checklist 1 (Pages) House Hunting Checklist 2 (Numbers) Moving List (Pages) Open House To Do Checklist (Numbers) Packing List (Numbers) 7 FORMS Buyer Questionnaire (Pages) Home Comparison (Numbers) Market Update Internal (Numbers) Open House Sign-In 1 (Pages) Open House Sign-In 2 (Numbers) Property List (Numbers) Pros vs Cons (Numbers) 9 LEGAL Commercial Lease Agreement (Pages) Listing Agreement (Pages) Offer to Purchase (Pages) Pet Agreement (Pages) Property Condition Disclosure Statement (Pages) Purchase Agreement (Pages) Residential Lease (Pages) Residential Sublease Agreement (Pages) Use and Occupancy Agreement (Pages) 36 MARKETING MATERIAL - 4 DESIGNS Brochure (Pages) x 4 Business Card (Pages) x 4 Door Hanger (Pages) x 4 Envelope (#10 & 8x11) (Pages) x 4 Flyer (Pages) x 4 Letter (Pages) x 4 Postcard (Pages) x 4 Poster (Pages) x 4 Welcome Sign (Pages) x 4 5 MISCELLANEOUS Magazine Brochure (Pages) Market Update Postcard (Pages) Mortgage Calculator (Numbers) Renovation Budget 1 (Numbers) Renovation Budget 2 (Numbers) EASILY CUSTOMIZABLE Once opened in Pages or Numbers you can apply your own content, colors, fonts, pictures, etc. 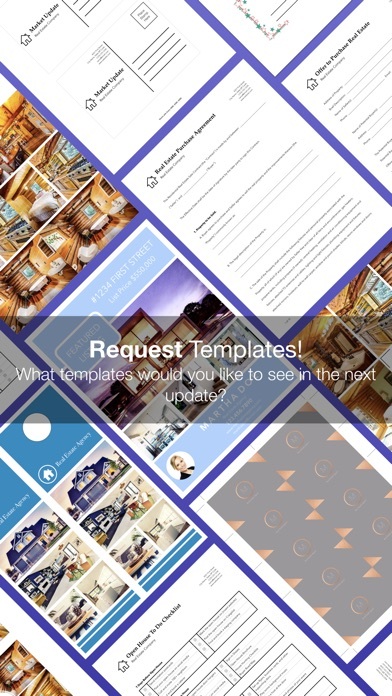 REQUEST TEMPLATES Let us know what templates you would like to see in the next update. UNIVERSAL APP This app works on iPad, iPhone and iPod touch. Therefore, do not forget to download this app onto your other devices - for free! - provided you purchased the app once. IMPORTANT: PAGES & NUMBERS REQUIRED! 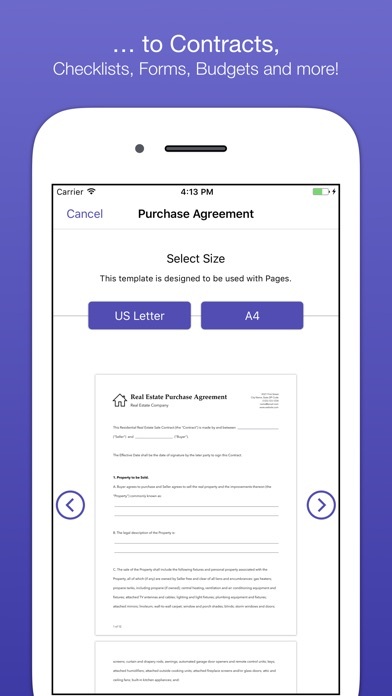 We recommend having Pages (Apple’s word processor) and Numbers (Apple’s spreadsheet app) installed on your device. For example, the flyer requires Pages, while the mortgage calculator requires Numbers. 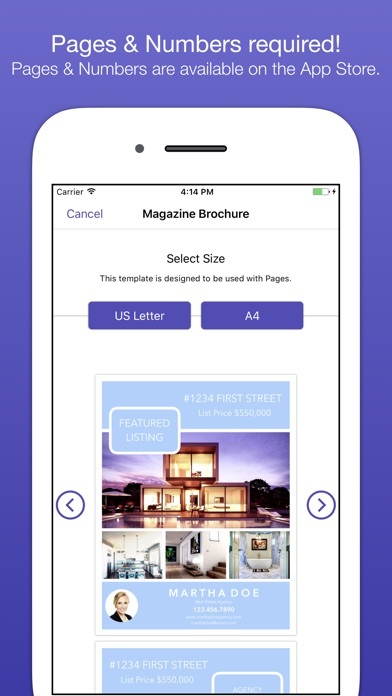 You can download Pages and Numbers for free from the App Store. DISCLAIMER Prior to using these forms, please consult with an attorney or other expert knowledgeable in the laws of the applicable jurisdiction and the specific intended use of those forms. All forms available are general in nature; are not based on the laws of any specific state or other jurisdiction but rather general principles of law and should only be used after first consulting with an attorney or other expert knowledgeable in the laws of the applicable jurisdiction and the specific intended use of those forms.